The implementation of an effective Quality Management System is critical to the success of every commercial organization. Quality improvement is a continuous process, driven by ongoing change in customer demands. In order to drive improvement in your quality assurance process you need to ensure you have a full understanding of the various requirements associated with implementing a quality system. Quality Management is about driving product and process improvement, designing to achieve quality expectations, ensuring a comprehensive documentation system is in place, ensuring all change is effected via a comprehensive change management process, capturing and acting upon customer complaints, implementing an effective quality audit process, …… etc..
♦ Quality in product and process design. ♦ Approach to good manufacturing practices. 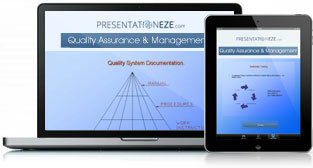 ♦ Implementing an effective quality documentation processes. ♦ Ensuring an effective change control process. ♦ Training for quality management system effectiveness. ♦ Product and process validation as part of a quality management system. ♦ Supplier quality assurance processes. ♦ Determination of quality costs. ♦ Managing and reporting deviations to controlled processes. ♦ Ensuring quality in projects. ♦ Handling complaints and product recalls. ♦ The impact of quality on competitiveness. ♦ Implementing an effective audit process to drive quality performance improvement.